This keyboard's modular design features a symmetrical grid layout that takes the unnecessary strain off your weakest fingers by centralizing the most commonly used Enter, Shift, and Tab keys. 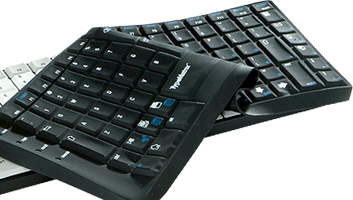 The 2030 is our smallest keyboard with full-sized keys and complete functionality. Available in Qwerty and Dvorak. Sleek, Lightweight, and Portable - Fits easily in a briefcase or backpack. Ergonomic - Less reaching to frequently used keys and mouse. Intuitive, Modular Design - Easy to learn. Our thin yet durable silicone skins are molded to fit the 2030 Keyboard perfectly. The skin completely covers the keyboard's top and sides. The skins are available in French and English - German, Spanish, and Swedish coming soon! A quick and convenient way to have both Qwerty and Dvorak legends available on one keyboard. Protects your keyboard from damage, dust, or spills. 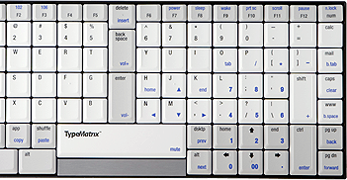 Our original 2020 TypeMatrix keyboard design introduced the modual, column-oriented typing design to the market. Keys are arranged symmetrically to promote less finger strain. Facilitates greater typing accuracy and speed.